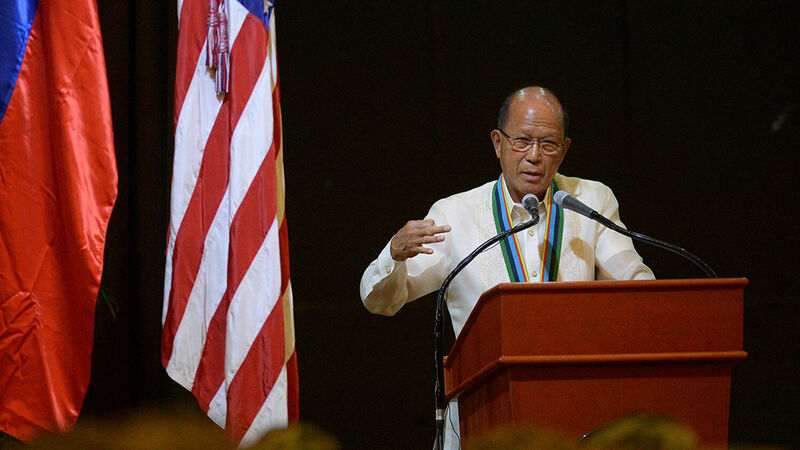 Philippine Defense Secretary Delfin Lorenzana delivers a speech during the closing ceremony of the annual joint U.S.-Philippines military exercise in Manila on May 19, 2017. China could gain a major victory in the region if the 67-year-old U.S.-Philippines Mutual Defense Treaty is revised. The 1951 treaty between the Philippines and the U.S. requires each nation to support the other if either is attacked. Under this treaty, the Philippines has been protected by the world’s superpower for a lifetime. China’s expansionist behavior and America’s unwillingness to confront China is leading the Philippines to consider revising the treaty. Many analysts see public statements by Philippine leaders questioning the treaty as a bold declaration that if the U.S. doesn’t stand up to China and protect its allies in the region, the Philippines will scrap the treaty. “With regard to the West Philippine Sea [South China Sea] dispute, which is the most pressing security issue now, the U.S. has opted to assume a seemingly hands-off attitude. We hope to hear a definitive stand on the matter,” Philippine Rep. Gary Alejano said. The fact that government officials are openly considering revising its defense treaty with the U.S. shows that the Philippines is questioning America’s ability to protect its allies. This is a major victory for China, who has warmed relations with the Philippines while militarizing islands in its backyard. China’s goal is to ultimately control the entire South China Sea. And with the Philippines potentially abandoning its defense treaty with the U.S., China could gain a strategic ally in Manila. China’s belligerent behavior in the South China Sea is leading to the fulfillment of this prophecy. Since about a third of world trade passes through this route, it is easy to see how China and other nations in the Eurasian bloc could shut America out of world trade. If the Philippines breaks away from its treaty with the U.S. and allies with China, then China could gain more control of the South China Sea. With the Philippines’ strategic geographic location east of the South China Sea, China is a step closer to fulfilling Bible prophecy.